Microsoft has never been ashamed to copy smaller companies if a trend proves popular enough, and its latest homage is dedicated to pint-sized PCs like the Raspberry Pi and Arduino boards. 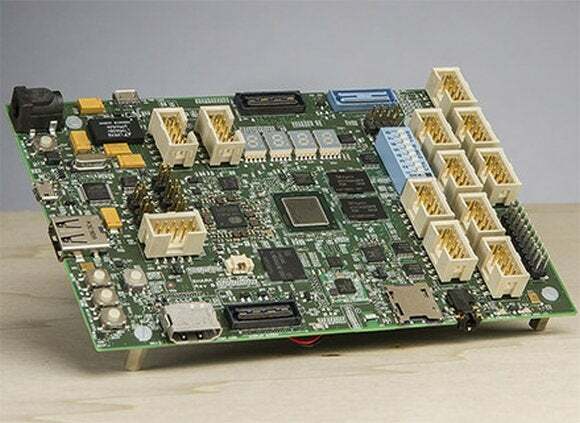 Hoping to show that Windows can run on just about anything, Microsoft has teamed with Intel and product manufacturer CircuitCo to announce a Windows-compatible development board, which is now available for pre-order, as ArsTechnica first reported. Dubbed the Sharks Cove, this tiny PC features a "Bay Trail" 1.33GHz Intel Atom processor with integrated graphics, 1GB of RAM, 16GB onboard storage, a microSD slot, HDMI, a MIPI connector, a single USB 2.0 port, and a micro-USB port for power. There's no Ethernet or Wi-Fi card onboard, so you'll need to use USB adapters to connect the board to the Internet or any other network. Developers looking for a breakdown of pin headers can check it out on the Sharks Cove site. The board measures 4 inches by 6 inches. While the Sharks Cove shares a similar size to other development boards, Microsoft's version isn't nearly as wallet-friendly as the competition. Sharks Cove will set you back a stunning $300, a price that includes the hardware, a Windows 8.1 image, and the "utilities necessary to apply it to the Sharks Cove," Microsoft said. Three hundred bucks is far more expensive than the recently released Raspberry Pi B+, which features half the RAM, no onboard storage, and a slower processor, but only costs $35. Still, at $300 anyone hoping to use a board for user-centric purposes like an entertainment center or old-school gaming emulator is probably better off with a Raspberry Pi or alternatives like the $55 BeagleBone Black or the upcoming $99 Minnow Board Max. Microsoft says its board is geared towards developers for creating software and drivers for Windows devices such as phones, tablets, and other miniature devices. The Sharks Cove can also be used for Android development. Anyone looking for an extra Windows PC on the cheap should skip development boards entirely and wait until later in 2014, when devices like the $200 Hewlett-Packard Stream and $250 laptops from Acer and Toshiba start rolling out.